Holiday Video Game Preview: Beyond 'Call Of Duty: Modern Warfare 3' We look at some of the upcoming video game releases, including the hugely hyped Call Of Duty 3: Modern Warfare. Earlier in the year when there was a paucity of great videogames, critics and players alike took time to savor games like L.A. Noire and Deus Ex: Human Revolution. That was then. In the fall, games come out with more alacrity than the speedy conveyor belt of chocolates in that iconic I Love Lucy Switching Jobs episode. More than two thirds of the year's games hit shelves between Labor Day and Thanksgiving. Here are some of the best. You may have seen the slick commercials, seemingly made by the characters in Mad Men, that tell you Modern Warfare 3 is the most anticipated game ever. I think that's Madison Avenue bloviation. Yet no one can argue with the sheer numbers: in the U.S. and U.K. alone, Modern Warfare 3 sold 6.5 million copies in its first 24 hours on the shelves. For the lovers of this military shooter series, this isn't just a game. It's a lifestyle full of glee, guns and gore. The game developers, who must have viewed every war movie made in the last decade, give you a cinematic game to play by yourself. You undertake every difficult military situation imaginable as you travel through this battle-weary world. I live across from the East River in New York, and when the fictional Russian Federation attacks from the water in a tight scene written by some action-minded Hollywood screenwriters, I really had to glance outside the window to see if it was actually happening. But the single player portion is merely an appetizer for online play in which gamers get together with friends to fight others. This constant fog of war is about the heart-thumping adrenaline you feel while you work together for victory. And it's also about learning the ins and outs of multiplayer maps. There, you might find a place to lurk in the shadows, the perfect hiding place for your concerted effort to defeat your enemies. After a terribly difficult year that saw the hacking of the PlayStation Network and the delay of its new handheld gaming device, Sony found its bright spot. 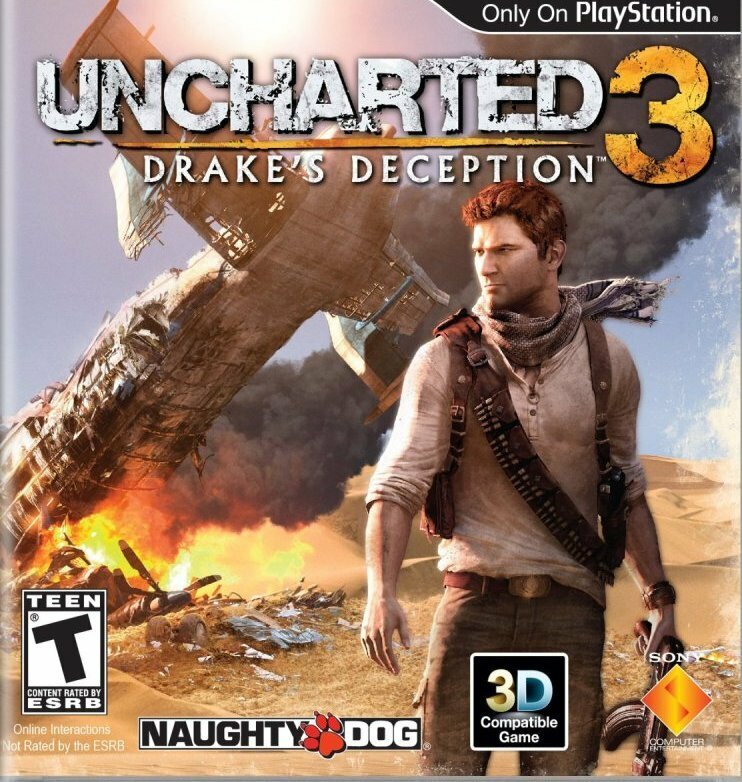 Uncharted 3: Drake's Deception is the latest installment in its filmic series featuring the fictional adventures of a cheeky descendent of Sir Francis Drake. This buddy romp written by the witty, literary-minded Amy Hennig is influenced by the a cornucopia of culture: the old penny dreadful novels, Huckleberry Finn, James Bond, The Count of Monte Cristo, the Perils of Pauline, Lawrence of Arabia and Indiana Jones. Early on you escape some violent goons by leaping from rooftop to rooftop like a caffienated monkey. Later, you're in a vast desert searching for lost treasure. While this year's model is not so terribly different from its landmark predecessor, the mayhem, hijinx and humor can't be denied. That's probably why Robert DeNiro is considering a role in the film version of Uncharted. Nintendo, too, has had an unusually crushing year. Its handheld gaming machine, which allows 3D without glasses, didn't sell as well as the Japanese company had expected. More, there hasn't been an unequivocally creditable Nintendo game for the Wii since the beginning of the year. That's changed with Skyward Sword, the 25th Anniversary edition of the heartwarming fantasy series created by Shigeru Miyamoto. Like Steven Spielberg in film, Miyamoto's vision of game design and characterization is that of Every Gamer. So each edition of the sword and sorcery-rife Zelda series sells in the millions. The gamer always takes the role of the taciturn Link, a green-suited, sword toting hero who looks like a young Robin Hood. Skyward Sword is at once sweet, cute, adventuresome and a little scary. In the first hour, you rescue your beloved method of transport, a giant bird called a Loftwing. Then, oh, hell, Zelda goes missing. On the back of this phoenix-like raptor, you have to dive through the swirling clouds to the curious world below to find her. While the Wii controls can be wonky at times, you'll enjoy battling the monstrous rapscallions you encounter and solving the devious puzzles (some of which are worthy of puzzlemaster Will Shortz). Various publishers have foisted dozens of Sesame Street games upon the youth of America over the years, and a few have had their charms. Yet it was a stroke of genius to match the characters of the long-running educational show with the great Tim Schafer, a game maker who's been working in the industry since 1989. Schafer's led groups that have created games like the mind-bending Psychonauts and noir-satire Grim Fandango, both of which are full of innovation and sarcastic wit. Now that he has little kids, he's turned to making games for tykes and toddlers. Once Upon A Monster is just the ticket for the small ones, who interact by jumping, waving and shrieking, and happily gesturing in front of the Xbox's Kinect controller. The painstakingly-crafted graphics take you into fairy tale worlds as you do Simon Says games, beat drums and lift the spirits of other characters like Marco the monster. The river sparkles in the sunlight as a dragon hisses overhead while and a prisoner is beheaded. Skyrim, the latest edition of an ambitious sword and sorcery series that began in 1994, is the probably the largest game of the year in terms of scope. In this role playing offering, you embark upon a nasty, brutish journey in a politically-divided world of Nordic myth and legend. Because the game is all about your choices, you can even eschew the primary plot of finding and slaying a massive, evil dragon to wander the beautiful terrain of rushing waterfalls, towering trees and looming mountains. I took a break and followed a bucolic path along the water only to be chased by a warrior whose food and belongings I absconded with. As the reptile-headed denizen caught up with me, I became frantic, paranoid. Panicked, I ran for my life and swam across a channel only to be cornered by unrelenting mutant walruses, each with three tusks. I led the reptile-headed warrior into the walrus lair and then slew them all. In Skyrim, you feel the depressing weight of being a hero, the wrathful consequences of moral lapses and the magical confidence of feeling burly and manly – even if you aren't in real life. Back in the day, a plangent, young-ish Neil Young sang, "It's better to burn out than it is to rust." That's precisely what happened to games like Rock Band and Guitar Hero. Publishers saturated the market. The fad was all-encompassing and ubiquitous. Then, it burnt itself out like a drugged-out rocker. But while everyone sounded the death knell of rhythm-based games, once so popular everywhere, Ubisoft was singing a line from Elvis Costello's "Mystery Dance": "Don't bury me cause I'm not dead yet." The educational beauty of Rocksmith isn't so much in the variety of songs. What's salient about Rocksmith is that it allows you to plug in a real guitar and learn how to play as you have fun – through games. It's as if gamification, the videogame-inspired reward system for all businesses - hyped so well by Jane McGonigal in her Reality Is Broken book - has come full circle. And there's no shame in that, especially with a novel offering like Rocksmith. A few weeks ago, Rockstar Games celebrated the 10th anniversary of its Grand Theft Auto III. That open world game changed everything because you could go almost anywhere and do almost anything as you played. Others have tried desperately to mimic what Rockstar does nearly perfectly. But it costs tens of millions to do and a company can die a miserable death if sales aren't in the millions. The publishers of Saints Row originally made a game that was inferior to Rockstar's brilliant offerings. But on their third try, they really got it right. While the bawdy lowbrow humor may make you blanch, the constant parodies (beginning with an urban riff on Star Wars) are well-conceived and effective. The well-written banter only serves to enhance the gameplay in this mature-rated game that centers on the vagaries of urban warfare. It's rife with wonderful, wicked, ridiculous action that only occasionally feels like frummery. All told, the developers of this game have been extremely smart in their crazy homage to all things in popular culture. But it's definitely not for kids. Harold Goldberg is the author of All Your Base Are Belong to Us, How 50 Years of Videogames Conquered Pop Culture. He can be found crowdsourcing a movie about games at www.playingwithfirefilm.com.